Our latest SoSS release is a feature supplement, these allow us to extend our analysis to a variety of topical areas. 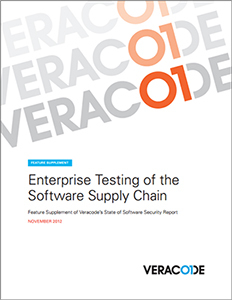 This feature supplement focuses on the actual state of vendor application security testing programs currently being implemented by our enterprise customers. 38% of vendor supplied applications complied with enterprise-defined policies vs. 10% with the OWASP Top Ten and 30% with CWE/SANS Top 25 industry-defined standards. Four of the top five flaw categories for web applications are also among the OWASP Top 10 most dangerous flaws and five of the top six flaw categories for non-web applications appear on the CWE/SANS Top 25 list of most dangerous flaws. SQL injection and cross-site scripting affect 40 percent and 71 percent of vendor-supplied web application versions, respectively. Enterprises that relied on an ad-hoc approach when requesting application security testing averaged four participating vendors, whereas enterprises with a structured approach had much higher levels of success, averaging participation from 38 vendors. Enterprises with structured programs enabled more vendors to achieve compliance quickly, with 45 percent of vendor applications becoming compliant within one week. The report is chock full of brand new data and graphs galore. If you're an enterprise organization you don't want to miss the latest State of Software Security report! Download Your Copy of SoSS Now!